It happened. We got away with 4 years. And I think its fixable. It only started yesterday that she was obsessed with scissors. And by the night, well that happened. She has this look she gets on her face when she has done something she knows she's not supposed to. That sly, deer in the headlight look. She had that as I caught her throwing away something in the trash. She throws things away like they're no big deal. She threw away an entire banana after eating one bite. That happens a lot. She threw away sugar cookies!! What? 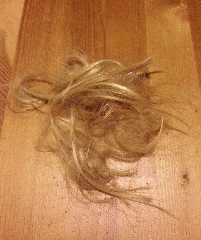 And last night, she threw away that giant bunch of beautiful hair. Anyway, this post is so we can remember. Its just hair right? When did your kids cut their hair for the first time? Augh! I am screaming for you right now. Do we get pics of the princess's new hairdo? When Abe was taking kids one night, Jerom cut off avery's pigtail right next to her head. It'll grow back. Not quickly, but eventually.